Immigration and Customs Enforcement (ICE) has repeatedly used ambiguous criteria to wrongfully accuse undocumented Latino immigrants of being affiliated with gangs -- often the brutal, Los Angeles-founded street gang MS-13 -- as a pretense to arrest them. Right-wing media outlets have responded by hyping the narrative of the prevalence in the U.S. of MS-13 to promote ICE. There have been a number of reports that ICE uses vague and sometimes overly broad criteria to wrongfully label a person as affiliated with a gang, which allows officers to arrest people without a criminal warrant. 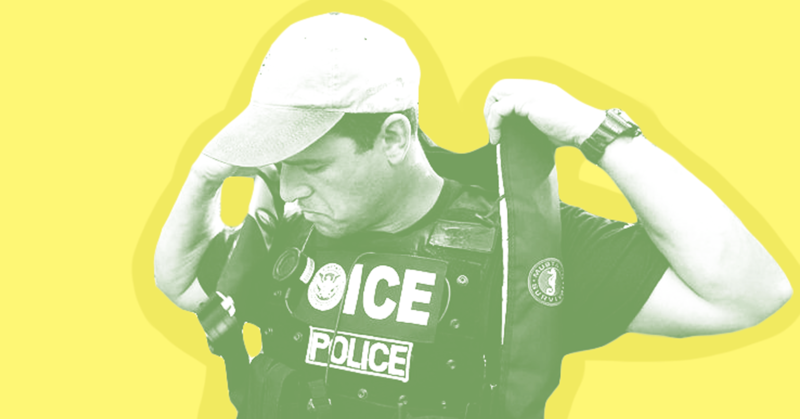 The result is unjustified arrests of law-abiding undocumented immigrants and overinflated numbers of how many undocumented immigrants are gang members, which right-wing media broadcast to their audiences without proper context. Last week, hosts and guests on Fox News mentioned gangs in the context of immigration on at least five different occasions. The Washington Examiner and Drudge Report also hopped on the bandwagon. As a result of these tactics, ICE has been targeting undocumented immigrants who haven’t been shown to be involved in any criminal activity. Daniel Ramirez Medina, for example, who was supposed to be protected under the Deferred Action for Childhood Arrivals (DACA) program, was placed in ICE custody, supposedly for gang involvement, for more than six weeks before being released. According to The Intercept, “the sum of the evidence is a tattoo on his arm that immigration officials believe is gang related, and statements that he allegedly made in custody” about people he spends time with. Similarly, ICE arrested -- and used excessive force against -- Wilmer Catalan-Ramirez after police erroneously identified him as a gang member. He was left with a fractured shoulder and loss of vision in one eye, and was denied proper medical attention while in custody. The New Yorker reported that because of ICE’s “nebulous indicators,” a teenager in Long Island, NY, was put in deportation proceedings for reasons including that he wore a Brooklyn Nets hat and allegedly performed “a gang handshake.” The third reason was his girlfriend: a 16-year-old U.S. citizen who had been kidnapped by a previous boyfriend after she ended their relationship when she found out he was an MS-13 member. The American Civil Liberties Union (ACLU) has argued that the tactic of “using unsubstantiated claims of gang affiliation to illegally detain teenagers” encourages profiling of Latinos, and the organization has filed a lawsuit alleging that federal immigration authorities were “wrongfully arresting Latino teens in New York” based on unfounded gang-related charges. Right-wing outlets are uninterested in telling such stories. Appearing on Fox News’ America’s Newsroom last week, Sen. Ron Johnson (R-WI) pointed to Operation Raging Bull -- an anti-gang operation led by ICE in 2016 and 2017 -- to demonstrate the alleged pervasiveness of immigrant gang members in the U.S. When that operation concluded, the right-wing media sphere was set ablaze with headlines trumpeting ICE’s arrest of between 200 and 300 gang members (the final count was 214 arrests in the U.S.). But the right-wing media outcry breezed over the fact that more than half of those swept up in ICE’s “gang crackdown” were arrested not on criminal charges but on immigration violations. The intersectional discrimination women of color often face while doing their jobs was put on full display this past week when Fox host Bill O’Reilly and White House press secretary Sean Spicer attacked Rep. Maxine Waters (D-CA) and veteran journalist April Ryan on their appearance and body language, respectively. The incidences, which both occurred in unusually public settings, inadvertently shined a light on the discrimination women of color too often face in their workplaces, while the subsequent reactions from right-wing media underscored the problems that hold women of color back. The pile-on of attacks revealed a unique obstacle women of color confront in their daily lives: the compounding effects of gender and racial discrimination. Researchers acknowledge that there is a dearth of research examining the intersection between sexist and racist attacks in the workplace. A number of studies, however, have revealed concerning statistics about barriers to success that women of color face. CNN reported on a University of California Hastings College of the Law study, writing, “While 66% of the women scientists [professor Joan] Williams studied (including white women) reported having to provide more evidence of competence than men, 77% of black women said they experienced that.” There have been multiple studies that highlight “unconscious bias” against women, and others that reveal more overt discrimination -- both of which have serious consequences in the long run. Studies and anecdotes continue to reaffirm the double hurdle women of color must clear in order to get hired, get promoted, and earn equal pay. The problems surrounding equal pay exemplify the issues unique to women of color. Recent research on the gender pay gap by the American Association of University Women found that “progress” to close income disparities between genders “has stalled in recent years” and that the pay gaps between genders and between racial/ethnic groups “cannot be explained by factors known to affect earnings and is likely due, at least in part, to discrimination.” The Center for American Progress recently found that while women overall earn 79 cents for every dollar a man earns, that gap widens by 19 cents for black women compared to white men. This “translates into an average lifetime earnings gap of $877,480 for each African-American woman versus her white male counterparts.” Latina women appear to fare even worse than other minorities; Pew Research Center estimated that in 2015, Latinas earned 58 cents for every dollar a man earned compared to the 82 cents per dollar that white women earn. Furthermore, conservative media outlets often obfuscate the issue of gender and racial discrimination in the workplace, which creates an obstacle in addressing the root of the problem. Right-wing media have repeatedly justified -- or denied the existence of -- the gender pay gap and have attempted to undermine progress in closing the gap. And while many people rallied in support of Waters and Ryan, many conservative figures ignored, defended, or even cheered on the assailants. USA Today pointed out that “Breitbart, the news site with ties to Trump chief strategist Steve Bannon, didn't appear to mention O'Reilly's comment, but published a post called ‘Maxine Waters: Something is “wrong” with Trump “He doesn't deserve to be president.”'” One conservative pundit covered up for O’Reilly’s sexist and racist commentary, falsely equating his attack on Waters to liberals calling Trump “orange.” Spicer received a similar wave of support from conservative outlets for his attacks on Ryan. Experts say that the discrimination that women of color face while doing their jobs is difficult to prove. But this past week, cable TV viewers witnessed them firsthand. Impunity for O'Reilly and Spicer after their attacks on Waters and Ryan could make it even more difficult for women of color to eliminate barriers to their success. Some right-wing media figures and outlets are attempting to twist and confuse the term “fake news” -- a specific phenomenon in which information is clearly and demonstrably fabricated, then packaged and distributed to appear as a legitimate source of news -- to attack outlets they disagree with. By redefining fake news in their own terms and claiming that reporting by outlets such as The New York Times and CNN constitute fake news, right-wing media figures are bolstering President-elect Donald Trump’s continued efforts to delegitimize mainstream news sources and their reporting, and muddling real concerns about fake news used as a weapon of active disinformation. None of these definitions are even remotely similar to how right-wing media figures are trying to redefine fake news. Attacking mainstream outlets as “fake” is the latest step in a conservative-media-fueled campaign to delegitimize credible news sources -- a dangerous path in a media landscape where people are already too willing to accept actual fake news, but are hard-pressed to believe real reporting. The Washington Free Beacon attempted to scandalize remarks made by Democratic presidential nominee Hillary Clinton in a recently published hacked audio recording of a closed door fundraiser in September 2015, falsely claiming that she “took a shot” at the Affordable Care Act (ACA) and made new calls for “fixes” to the law. In reality, Clinton has openly advocated for improvements to the Affordable Care Act throughout her campaign (as has President Obama). In a October 3 post, The Washington Free Beacon falsely claimed that “Hillary Clinton took a shot at President Obama’s landmark health care program in private remarks to donors even as she pledged to defend the law.” According to the conservative news site, "The remarks were captured in an audio recording sent by campaign volunteer Ian Mellul to Nick Merrill, Clinton’s traveling press secretary. The email containing the recording was one of thousands released by hackers believed to have ties to the Russian government." While the Free Beacon article frames her private comments as a contrast “to her public remarks,” in reality, the audio recording reconfirms Clinton’s stated commitment to improving and building on the health care law. Advocating for improvements to the Affordable Care Act is hardly a controversial position, as even President Obama supports making reforms to the landmark law. In an article published by The Journal of the American Medical Association (JAMA) on July 11, President Obama noted that there is still work to be done on health care reform, including the need for a “Medicare-like public plan” that could compete with private insurance. Obama has previously reached out to insurance companies asking them to help him fix the ACA, and he has continued to push for “a series of fixes” aimed at improving the law, recognizing that while the law has made incredible progress, there is work yet to be done. Media figures criticized Fox News host Megyn Kelly for her “fluff” interview with Donald Trump during her Fox Broadcasting special, Megyn Kelly Presents.